Home Other Topics What are Notes to Accounts? Also known notes to financial statements, footnotes, notes to accounts are supporting information that is usually provided along with a company’s final accounts or financial statements. Many such notes are required to be provided by law, including details related to provisions, reserves, depreciation, investments, inventory, share capital, employee benefits, contingencies, etc. Other information supplied along with the financial statements may be a product of the accounting standards being followed by the business. Notes to accounts help users of accounting information to understand the current financial position of a company and act as a support for its estimated future performance. It acts as supplementary information furnished along with the final accounts of a company and may be tremendous in size depending on the company, accounting framework and nature of the business. The information supplied depends on the accounting standards used such as IFRS or GAAP. Financial statements filed quarterly/annually by the companies with their local statutory body such as the SEC in the USA are accompanied by the notes to accounts. 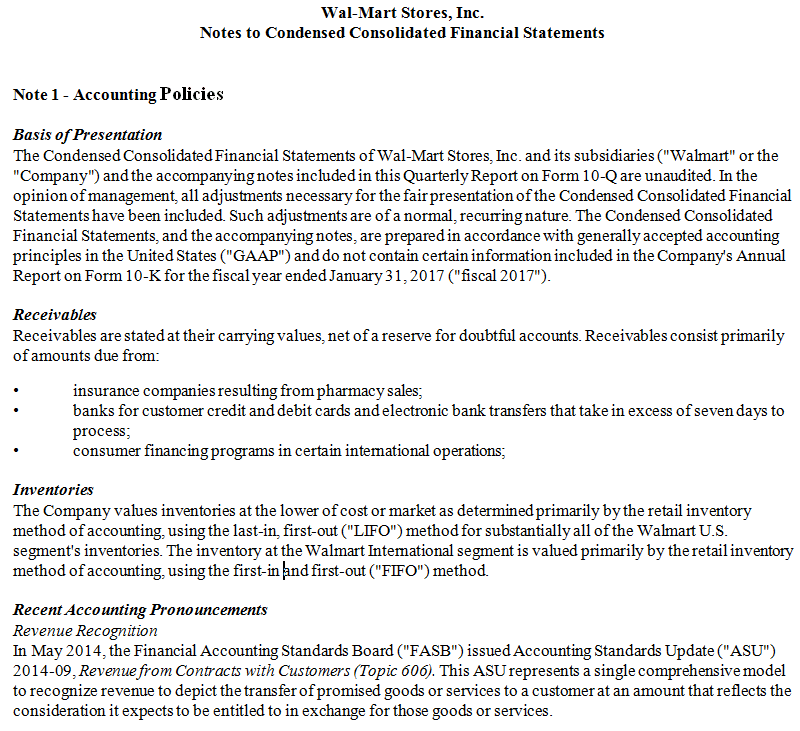 Below is a live excerpt submitted by Walmart Inc. as on January 31st, 2018, it is a trimmed piece of the footnote and should only be seen as a reference for understanding. Accounting Policies/Changes Footnotes show all impactful accounting principles being used and significant changes (if any). Acquisitions and Mergers Any M&A related transaction including all acquired assets, liabilities, goodwill, etc. Contingencies and Litigations Notes to financial statements include any contingent liabilities along with its details and timeline. Depreciation Adopted method of depreciation on fixed assets, capitalized interest & impairments are disclosed. Exceptional Items Any exceptional item such as a huge loss, an unexpected rise in expense, etc. Fair Value Measurements Notes to financial statements also show related amount and reasons of fair value measurements. Goodwill Changes in goodwill and acquisition of goodwill (if any) are mentioned. Inventories and Investments Stock evaluation method is described and for investments, any gains/losses due to being realized are described. Leases Future outflow of lease payments is estimated and mentioned in the footnotes. Long-Term Debt All obligations due to be paid in the next 5 years including loans, interest on loans, etc. Non-Cash Transactions Any event concluding to a profit or loss in future is specified. Receivables and Payables Notes to accounts contain significant receivables and payables including the parties concerned. Risk and Possibilities Any likely risk that may affect the company in future such as a govt. policy, expected technology advancement is also stated. Shareholder’s capital Notes to accounts generally represent the issue of shares, buyback programs, convertible shares, arrears, etc.